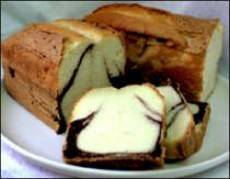 Ribbons of chocolate swirl through this moist, buttery pound cake. A delicious dessert anytime. Serve, topped with a scoop of vanilla or chocolate ice cream, or sprinkle slices with powdered sugar for an extra tasty treat. 1. Preheat oven to 325 degrees F (160 C). Grease and flour a 9 x 5 x 3-inch or a 8 x 4 x 2-inch loaf pan; set aside. 2. In a medium bowl, stir together the flour, baking powder and salt; set aside. 3. In a large mixing bowl, beat butter with electric mixer on medium to high speed for 30 seconds. Add sugar and vanilla; beat until fluffy. Add eggs, one at a time, beating well after each addition. 4. Add flour mixture and milk alternately to butter mixture, beating on low speed after each addition until just combined. Spread 3/4 of the batter in prepared pan. Sprinkle with chocolate pieces. Spread remaining batter on top. 5. Bake the cake in preheated 325 degree F (160 C) oven for 55 to 60 minutes for the 9 x 5 x 3-inch loaf or 65 to 75 minutes for the 8 x 4 x 2-inch loaf or until a toothpick inserted near the center comes out clean. Cool in pan for 15 minutes. Loosen the edges of the cake. Remove from pan and cool completely on wire rack. 6. Prepare Chocolate Frosting (see below). Drizzle frosting over completely cooled cake. In a medium microwavable bowl, combine 1 tablespoon unsalted butter or regular butter and 1/2 ounce unsweetened chocolate, cut up. Microcook on 100% power (high) for 45 to 60 seconds or until the chocolate is softened (or heat chocolate in a saucepan over low heat). Stir until smooth; cool to room temperature. Stir in 1/2 teaspoon vanilla and dash salt. With electric mixer on low speed, beat in 3/4 cup sifted powdered sugar and 1 to 2 tablespoons milk; beat on high speed until desired consistency. Spread over top of cake. Looks great, can't wait to try it! wow..this cake is absolutely divine..so delcious and moist AND so easy to make. I will definately be making it again although maybe i will add less sugar next time. Absolutely delicious. Though, a few things I'd do differently: Fold in the chocolate chips in the batter and keep the pan in the middle of the oven - I didn't burn the bottom, but it was just slightly browner than I wanted. Things that I DID differently: I had 2 small eggs, so I added a third, and to it one-eighth teaspoon extra vanilla. It's cooling right now. Well, half of it. The family couldn't wait to try it out.